Port Moresby, popularly known as Pom City or simply Moresby, is the capital and largest city of Papua New Guinea (PNG). The city is the gateway to PNG as all visitors have to pass through the town. The city reached its prominence as a trade center in the second half of the 19th century. If the world history interests you, it might be known to you that what made the Imperial Japanese forces to target this city. If you are looking for an escape from the concrete jungle, booking cheap flights to Port Moresby Papua New Guinea with Cheapfaremart can help you. PNG is a country with the lowest urban population. A leisure walk along the Ela Beach, shopping at its favorite craft market for carvings, handwoven baskets, or other handcrafts, exploring the rich flora and fauna at Moitaka Wildlife Sanctuary, and other eco outdoor activities are a top favorite of visitors. Where is Port Moresby Located Geographically? The city is situated on the shores of the Gulf of Papua. The indigenous people of the area are the Motu-Koitabu. The city has been named after Captain John Moresby who arrived in 1873 as part of the British’s colonization attempt. He also raised the British flag at three unknown islands that he identified in the Coral Sea. He named it after his father, Admiral Sir Fairfax Moresby. What are the Top Airports in Port Moresby? Port Moresby is served by Jacksons International Airport (POM), the most significant international airport in PNG. The airport operates regular domestic and international services. Most of the flights from the US cities are connecting ones with a stopover in Brisbane, Manila, Hong Kong, and Singapore. How Long is the Flight to Port Moresby? You may opt for nonstop or connecting flights to Port Moresby. The table below shows the flight distance and flight time from some of the favorite US cities. Which Airlines Fly to Port Moresby? Top airlines offering flights to Port Moresby include Air Niugini, Philippine Airlines, PNG Air, Qantas, and Virgin Australia. Use our flight booking engine to filter the results by airlines and type of flights: nonstop, one-stop, and two-stop. This will help you to zero in on the cheapest air tickets to Port Moresby. How Much Does It Cost to Fly to Port Moresby? We have displayed the cheapest flights to Port Moresby in the table on the top. However, the fares are dynamic. 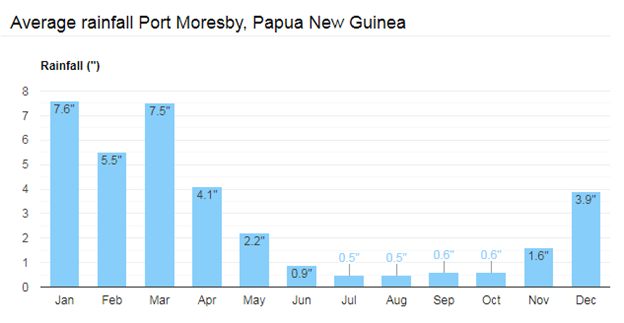 The displayed fares for the round-trip flights to Port Moresby, England are based on historical data, non-warranted and subject to change at the time of booking. The costs of airline tickets to Port Moresby are inclusive of fuel surcharges, our service fee and taxes levied by airlines/airports/regulators. Compare Port Moresby Airfares with different airlines now. We are an ASTA (American Society of Travel Agents) –approved travel company with a proven track record in serving travelers with the right travel information and services they need to plan a trip. When you perform a search, like Google, out flight comparison engine shows a search result page listing all the top deals on Port Moresby flights. Take note of the itinerary and fares and book your airline ticket with a carrier that offers the lowest price. If you are flexible with your travel dates, choose Flexible Date Fare suggestion offered at the top of the flight search result. If you own a flight discount coupon, apply it at the time of checkout. 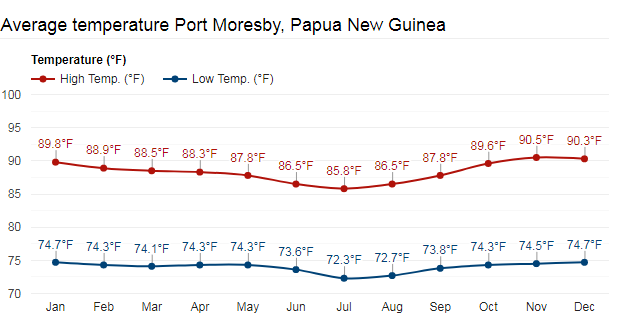 What is the Best Time to Visit Port Moresby? The wet season runs from December to March, which is not the best time for hiking and wildlife watching. However, if you’re coming for surfing, this is when you’ll find the best waves off the north coast and the islands. The drier months of May through to October is generally the most pleasant time to visit. It’s also when many of the festivals are held. In most parts of PNG, diving is good year-round; Milne Bay, however, has the best visibility from September to January and from April to June. The best times to visit Moresby is between June and November when the weather remains dry and the temperature stays in the comfortable zone. October, November and December are the hottest months when the average upper temperature swings in the lows of 90s°F. The wet season starts from November through March and April, and recedes in May. What are the Top Attractions in Port Moresby? Usher in an amazing beach experience. Formerly, the beach was called as Era Kone, meaning ‘Turtle Beach’ in the local language. Bask in the sun, play beach volleyball, take a boardwalk or take pleasure in other recreational facilities present in the area. If you desire to choose Ela Beach as your temporary stay, you can. There is a three-star hotel available here along with two kiosks and an amphitheater. The beach also serves as a venue for the annual Hiri-Moale Festival. This is a place of great historical significance. The monument brings alive the bravery of 3,824 Commonwealth soldiers who laid down their priceless lives in the World War II fighting in the former Territory of Papua and on Bougainville Island. Want to explore the natural beauty of Port Moresby? There couldn’t be a better means. On foot, cover the Owen Stanley Range of Central Papua New Guinea. You start trekking from a small settlement on the upper reaches of the Lakekamu River. If you love flora and fauna of rainforest, you won’t mind traveling 201 miles (324 km) to reach this beautiful place. The habitat comprises 3,000 sq meters (32,291 sq ft) of reconstructed rainforest and includes a pond, raised walkways, birds, saltwater crocodile and cassowaries and more. Why Book Air Tickets to Port Moresby with Cheapfaremart? Book the cheapest flights to Port Moresby. For assistance, feel free to contact us at 1-844-869-5222.